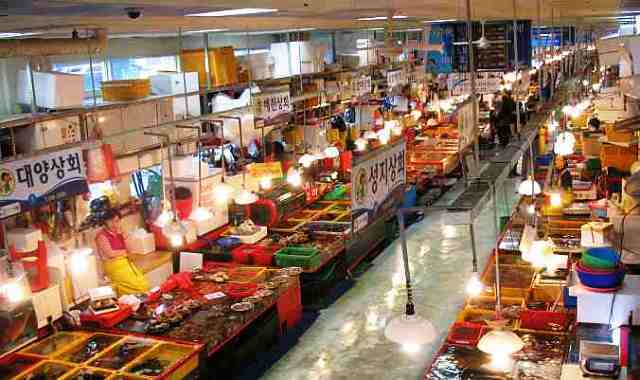 Situated between Namp’o-dong and Ch’ungmu-dong, Jagalchi Fish Market is Korea’s biggest seafood market, consisting of two sections – a fresh seafood section in the western area and a dried seafood section in the east. Jagalchi is derived from the term ‘jagal’, which means small rocks and ‘chi’, a traditional Korean term depicting a village next to the seashore, which makes sense as it is roughly translated as ‘Pebble Village’. In the past, it was believed that the area where the fish market is situated had many little rocks. One can’t see the little rocks today as the area is entirely concrete, along with the numerous buildings and wharf built across the area. Jagalchi Fish Market should not be considered merely a tourist destination, although that is what some Korean tourist publications would have you think. To visit the place is to truly witness the commercial world of selling fresh fish and the retail of live fish and many other seafood products. Looking around Jagalchi Fish Market, you will be amazed by the huge volume of fish stands packed into this place. Fish vendors vary depending on their stores; vendors with fixed stores with permanent structures, those with only platform grounds selling in parking areas or semi-permanent stores in the streetside as well as the occasional street peddlers on the sidewalk holding their cardboard box. The large Shindonga Market can be found at the center of the market area. Strolling around this place, it can be an unforgettable experience of sight and smell. Before entering the Shindonga building, you can see a covered yet al fresco market full of women selling their products. Most of the vendors here are middle-aged Korean women, hence the market is also known as Jagalchi Ahjumma. The ‘ahjummas’ or Korean married women sell seafood and similar fish fresh across the board, and prices aren’t often shown so get ready for some little bargaining. You may find the ahjummas working in the fish market as boisterous and tough but they are kind and pleasant enough. They work hard cleaning and processing the seafood, making them one of the strong foundations responsible for the persistence of Jagalchi as a fish market. Moving into the 6-storey Shindonga Market building, the entire ground floor is filled with nothing but raw fish and fresh seafood in trays, bowls, tanks, ice and so on. Even though you possibly won’t be buying any fresh fish to bring home with you, this section is an excellent place to observe a wide variety of seafood you may have never seen in your life. Other than that, it is also the best place to eat fresh fish straight from the container. Fish and shellfish are caught every day and are sold immediately to customers. You can see lined tanks filled with all sorts of marine life such as squid, shellfish, eel and mollusks. There is an area where workers prepare the seafood for long-term storage. Going up on the next floor is the dried fish section along with a few restaurants. On the succeeding floors are numerous seafood restaurants, coffee shops and convenience stores. In front of the building is an elevator so you can easily reach the fancy restaurants on the upper floors, which makes sense, as you would not want to drench your nice shoes or clothes on the wet floor of the raw market section. To access Jagalchi Fish Market, take Line 1 going to Nampo-dong Station or in Jagalchi exit 2. You may also ride Bus No. 139, which will take you right in front of the market entrance.